The head of the global chemical watchdog agency on Wednesday rejected Russian claims that traces of a second nerve agent were discovered in the English city where former Russian spy Sergei Skripal and his daughter were poisoned. Britain blames Russia for the attack, which it says was carried out by smearing a Soviet-developed nerve agent known as Novichok on a door handle at Sergei Skripal's house in Salisbury. Moscow denies involvement. He said the analysis - done at the request of the Organization for the Prohibition of Chemical Weapons - indicated that samples contained BZ nerve agent and its precursor. He said BZ was part of the chemical arsenals of the U.S., Britain and other NATO countries, while the Soviet Union and Russia never developed the agent. 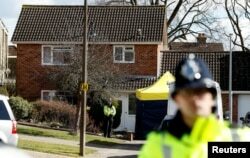 FILE - Police officers stand guard outside the home of Sergei Skripal in Salisbury, Britain, March 8, 2018. Britain's representative to the OPCW, Ambassador Peter Wilson, slammed the Russian foreign minister's comments as a breach of the treaty outlawing chemical weapons. 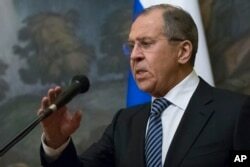 FILE - Russian Foreign Minister Sergey Lavrov speaks to the media in Moscow, Russia, March 29, 2018. Russia's representative to the OPCW, Ambassador Alexander Shulgin, repeated Moscow's denials and accused Britain of a string of lies. Shulgin at a later news conference accused Britain of trying to turn the executive council meeting into “a kangaroo court” and suggested that Britain could have arranged the attack on the Skripals to counter domestic tensions over Britain's withdrawal from the European Union. “Perhaps the government of Theresa May, weakened by the troubles associated with Brexit, needs society to rally around this government,'' he said. Shulgin also said Russia wouldn't accept the results of any report on the matter unless it gets full access to investigation details, consular access to the Skripals, and participation in the probe by Russian experts. The envoy also spent several minutes of digression on Britain's alleged “very impressive experience” of using poison abroad, including involvement in the 1916 poisoning of Rasputin, a self-styled mystic who held great influence with Czar Nicholas II's wife. 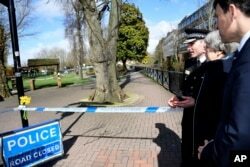 FILE - Britain's Prime Minister Theresa May is accompanied by Wiltshire Police Chief Constable Kier Pritchard and Salisbury MP John Glen, as she views the area where former Russian double agent Sergei Skripal and his daughter were found critically ill, in Salisbury, Britain. The Skripals were hospitalized for weeks in critical condition. Yulia Skripal was discharged last week from Salisbury District Hospital, where her father continues to be treated. “We believe that only Russia had the technical means, operational experience and motive to target the Skripals,” Wilson said. Wilson warned the Chemical Weapons Convention was being undermined by a growing use of nerve agents and other poisons, mentioning the 2017 assassination in Malaysia of North Korean leader Kim Jong Un's estranged half-brother, in addition to the Salisbury attack and the use of poison gas in Syria and Iraq. 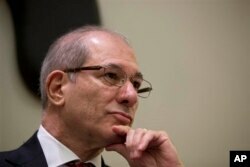 FILE - OPCW Director-General Ahmet Uzumcu attends press conference, Rome, Jan. 16, 2014. The OPCW and Russia last year celebrated the destruction of the country's final declared stocks. The antagonism between Britain and Russia played out again in the U.N. Security Council on Wednesday afternoon after U.N. disarmament chief Izumi Nakamitsu briefed members on the OPCW findings. Russian Ambassador Vassily Nebenzia said the council heard “the same lies” and “mendacious, baseless and slanderous” allegations that the U.K. has been putting forward since the attack. He said the OPCW report only confirmed that the substance could be produced in a well-equipped lab, stressing that such labs exist in the U.K., U.S. and a host of other countries.